Our hosts have been wonderful. Like myself, David is a keen cook and we’ve been well fed and watered on a regular basis. Wanting to repay their kindness and give them a bit of a night off, being in the correct vicinity for some of the more exotic ingredients, I volunteered to make a Thai-style green curry from scratch. These guys grow fresh lemongrass in pots around their house, for Darwin’s sake. Magic! So, last night it was my turn in the steamy kitchen. Having harvested a few stalks of extremely aromatic, fresh lemongrass, I began chopping it up to make the Thai green chilli paste. Also like me, David maintains a very sharp set of knives with which, on the second or third chop, Mr. Clutz then managed to harvest the end of his left index finger. Part of my fingernail disappeared along with my fingertip and blood began flowing. Our first attempt to stem the flow failed but the second was more successful; serious Singaporean surgery was avoided. Not finding any bits of Franco lurking in the ingredients, I sat down with a bandaged finger, a gin and tonic or two and assumed the role of executive chef while David came out of retirement to reprise his kitchen role, ably assisted by Francine and their Filipino maid. I don’t think the Filipino maid thought much to our westernized version of a Thai curry – the addition of chicken stock caused a raised eyebrow or two – but she helped very willingly. So much for giving David an evening off. Anyway, with my finger bandaged and still throbbing, today I necessarily left my camera at home, left the snapping to Francine and we went with David to see some sights of Singapore’s Chinatown. 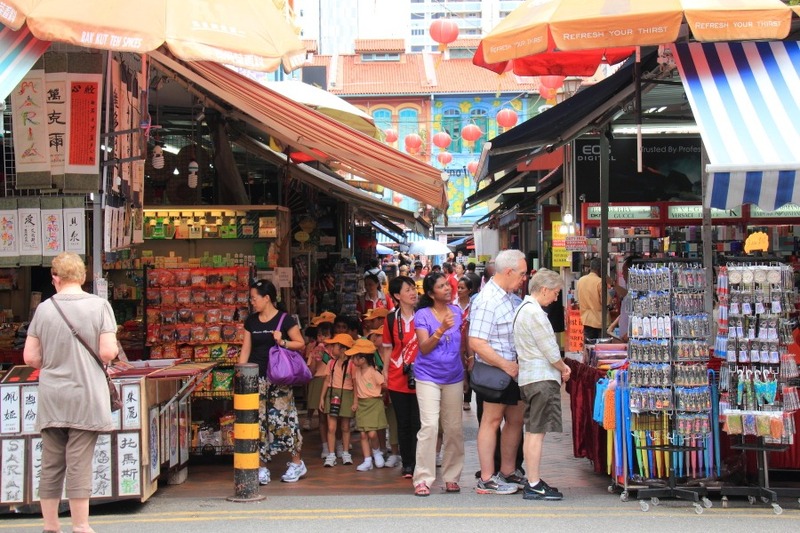 The week before we originally arrived in Singapore was Chinese/Lunar New Year. 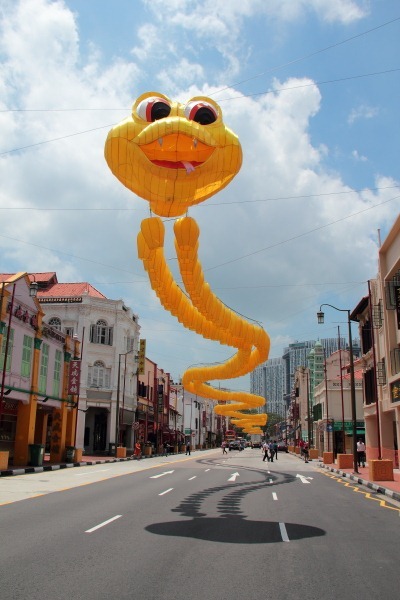 We’ve just entered the year of the snake and the first sight we saw was this brilliant effigy, made mostly of lanterns and running the length of the street. How terrific is that? How did Francine not get flattened standing in the middle of the road snapping it? Of course, like many Chinatowns, this one is full of the expected tourist trap trinkets that you wonder why you bought when you get back home. 13 ancient temples in Cambodia not enough to sate ones cultural curiosity? Today two more temples were on our agenda in Chinatown, though these are active temples rather than ancient. 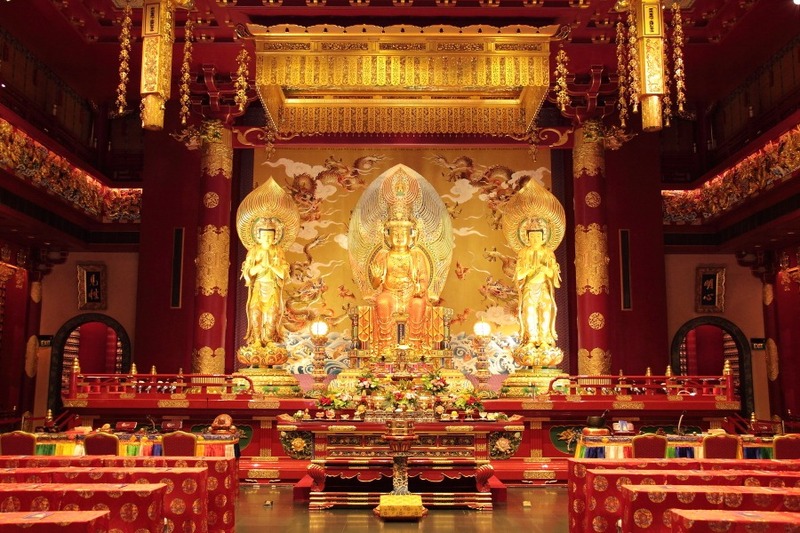 First up was the Buddha Tooth Relic Temple and Museum. No, really, this place supposedly has one of Buddha’s teeth, or a bit of one, at least. [Excuse: I was distracted by my throbbing finger and only half concentrating.] The place was staggeringly opulent, though, with more sponsored Buddha effigies than you could waggle an injured finger at. Every inch of every inside wall is a repeat of the picture on the right. 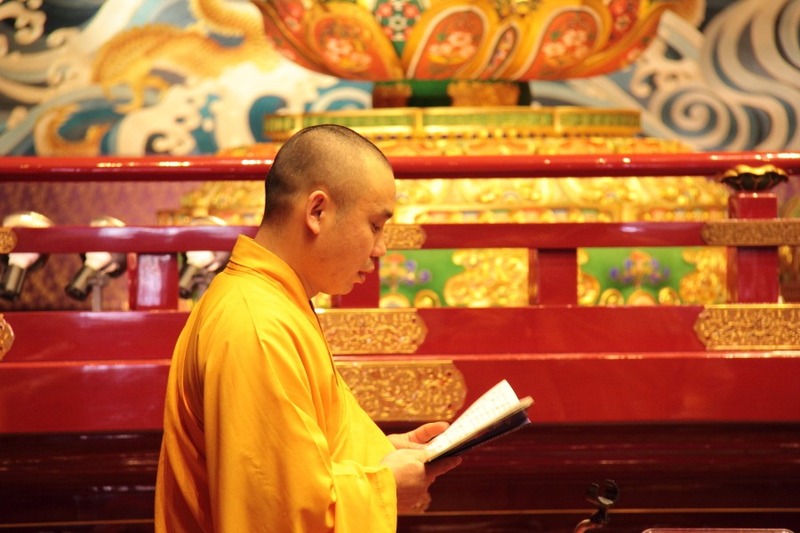 The atmosphere inside was enhanced when some monks appeared and began chanting. I have to say that I have a very low opinion of pretty much all religion, siding firmly with Professor Richard Dawkins on the laughability of any concept involving one or more “omnipotent beings”. 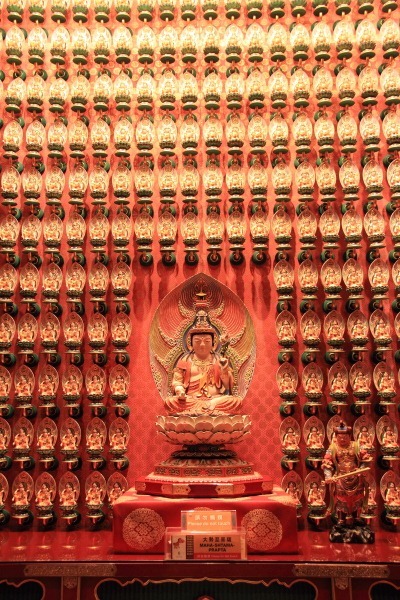 I make an exception, however, when it comes to Buddhism. The story might still strain belief but, apart from the fact that Buddha apparently classed himself as a teacher rather than a deity, Buddhism is the only religion I’ve personally come across that seems to be completely non-violent and moderate, preaching “the middle way”. 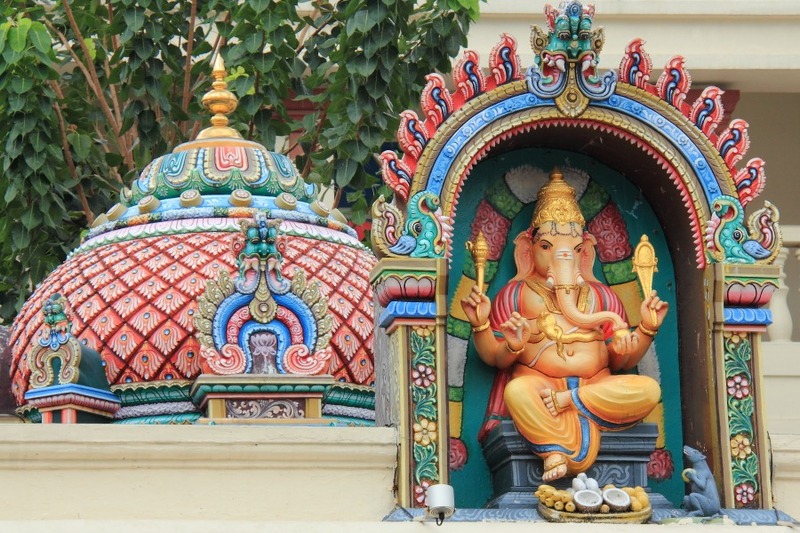 In Cambodia we learned that their religious history oscillated between Buddhism and Hinduism. When the Hindus were top dogs, what did they do to the Buddhist temples? Went round destroying or removing the Buddhist icons. 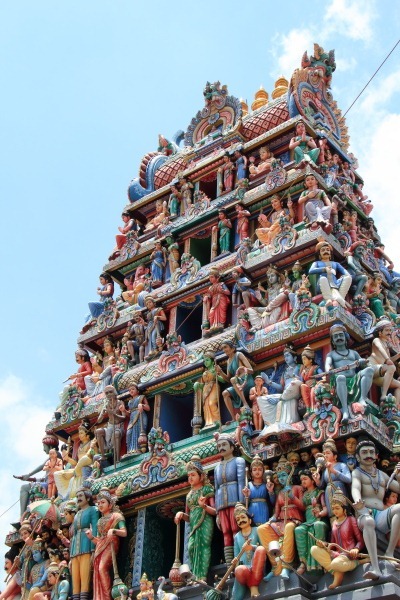 What did Buddhists do to Hindu temples? Nothing. Enough said.